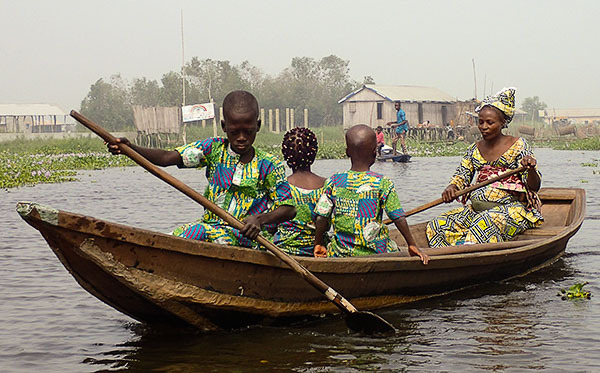 A journey through Ghana, Togo, Benin and Burkina Faso – culture, wildlife and trekking! As many of you who are on our email list will already know, we’ve just started taking bookings for our trips in late 2016/early 2017 – and are pleased to say that seats are selling fast! If you are keen on joining us for a trip please get in touch with us via our Enquiry Form and come and see some of this magical part of the African continent for yourself. We ran our new Accra to Ouagadougou trip for the first time last month, and welcomed Frank, Tracey, Tony F, Tony K and Sam to join those who had travelled with us from Dakar and Freetown. After some initial confusion, it was revealed that Frank was the owner of the trumpet that had mysteriously found its way onto the truck the previous evening! We visited Ghana, Togo, Benin and Burkina Faso on this trip, and this blog post covers the first 2 weeks of the trip. 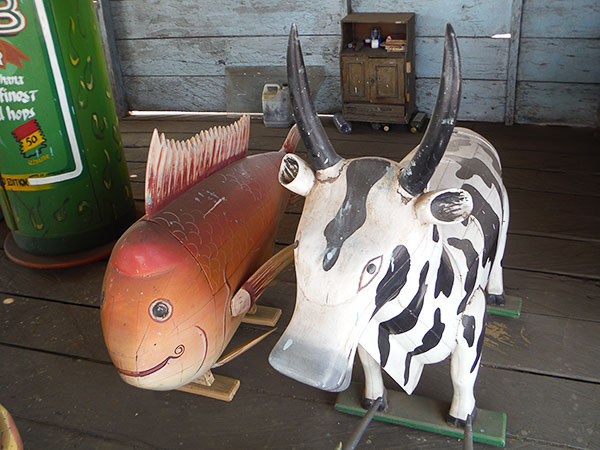 One of the highlights of southern Ghana is visiting the coffin makers around Accra, who make some lively and unusual designs. Above are some of the impressive examples we got to see. A number of the group went on a walking tour of Nima, a lively residential district of Accra for an insight into the lives of the local people. 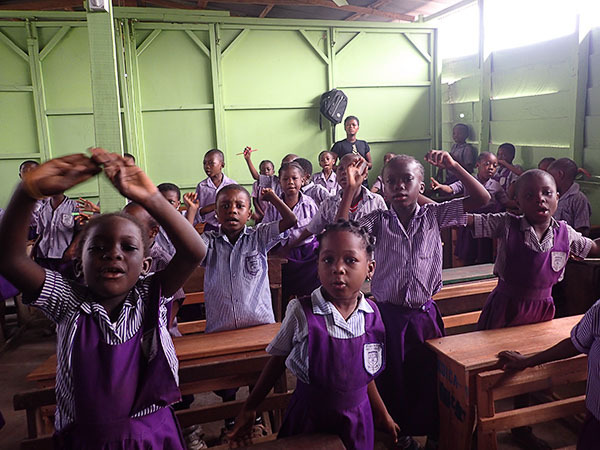 The guide was the principal of a primary school: as you can see the children were rather excited when we visited their classroom! 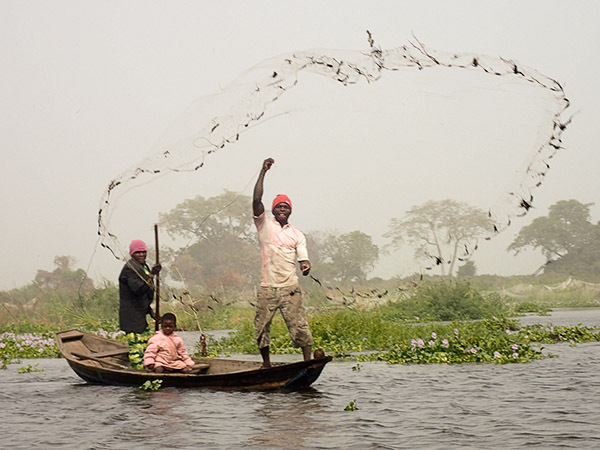 From Accra we headed to Ghana’s Volta region, a beautiful but relatively little visited area which is sandwiched between the artificial reservoir of Lake Volta and the Togolese border. We enjoyed the cool air and beautiful views up in the hills, a lovely contrast to the weather on the coast. Frank even had some time for trumpet practice! 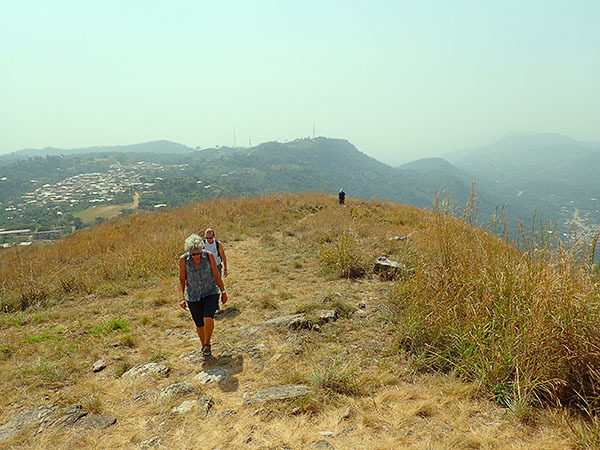 The views from the top of Mount Gemi down to Lake Volta and across to Togo would have been great if it wasn’t so hazy! 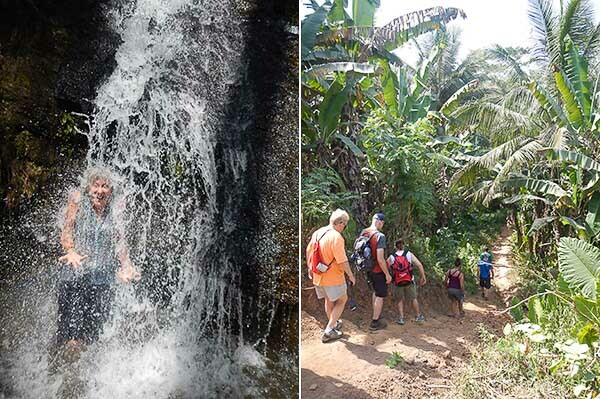 Above are waterfalls near Amedzofe that most of the group visited after the trek for a refreshing dip. 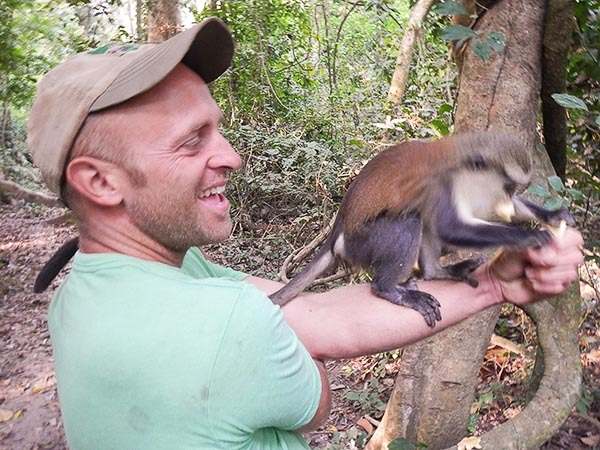 Before we crossed over the border to Togo, we visited a community of habituated Mona monkeys which are revered as sacred by the locals. Jase seemed to be feeding them the tastiest bananas! 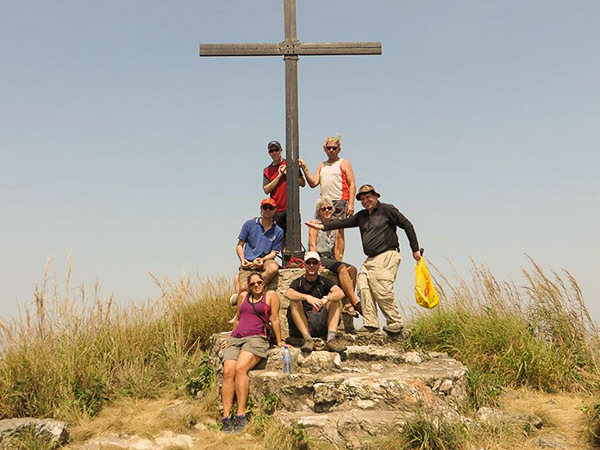 Our first stop in Togo was among the cool green hills close to the summit of Mount Klouto. 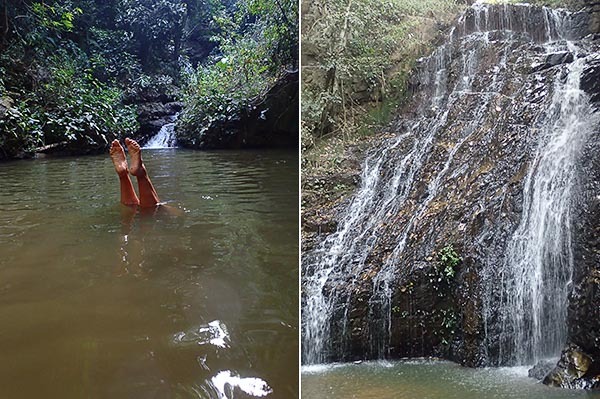 We walked among coffee plantations, explored villages, learnt about medicinal plants and natural dyes, cooled off under waterfalls, and looked for butterflies. We enjoyed a great evening of drumming, dancing and fire breathing with plenty of opportunities for dancing practice which we so clearly needed! 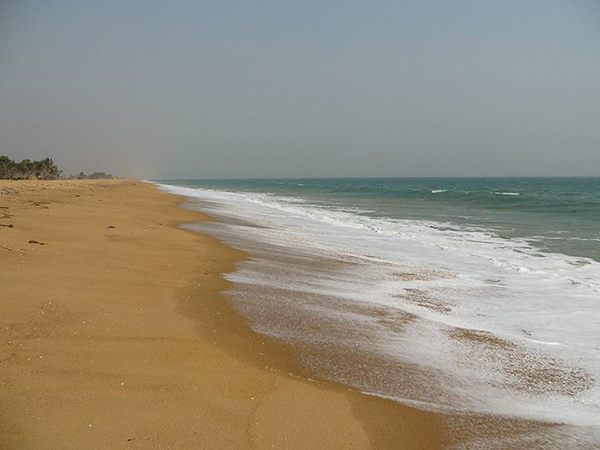 After a brief stop in Lome to visit the famous fetish market, we arrived in Grand Popo in Benin where we camped on the stunning beach for a couple of nights. Some of us enjoyed boat trips to visit fishing villages and to see salt production where the Mono river meets the sea. 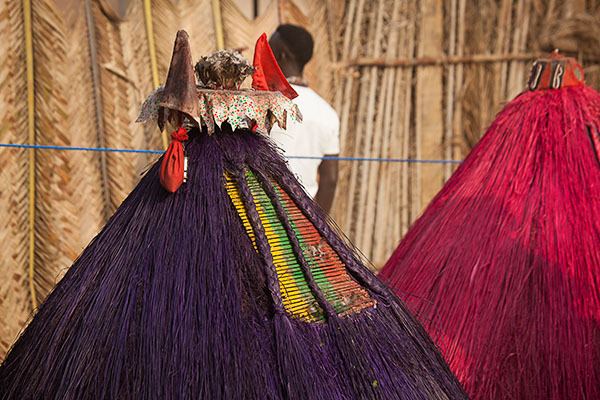 Above and below are photos from the voodoo ceremony we witnessed in southern Benin. Voodoo continues to play a huge role in the culture of the people in Togo and Benin, fascinating though a little bewildering at times! We were encouraged to try the local palm spirit while watching the ceremony, sprinkled with talcum powder and sprayed with perfume. Al and Jase smelt the best they had in weeks! 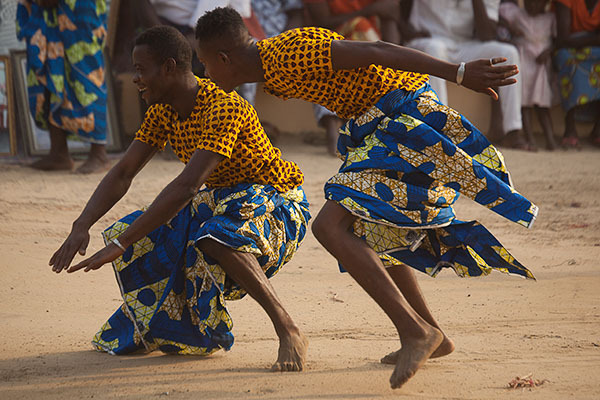 Ouidah is known as a centre of the voodoo religion, as well as having a tragic history as a port from which many millions of slaves were transported across the Atlantic to the Americas. We visited the famous python temple, numerous other temples and shrines, and learnt about how the voodoo religion travelled across the Atlantic with the slave trade to parts of Brazil and the Caribbean. We spent Christmas in Ganvie, staying at the famous stilt village on Lake Nokoue, an area originally settled by people escaping the slave trade. After a tour of the village we spent the rest of the afternoon and evening watching the world go by. Frank entertained both the locals and the group by playing Christmas carols on his trumpet! Many people were celebrating by singing and dancing on boats parading around the village; it was certainly a memorable Christmas! Having spent 2 weeks slowly exploring Ghana’s Volta region and the south of Togo and Benin, after Christmas we had a couple of days driving up to the north of Togo. 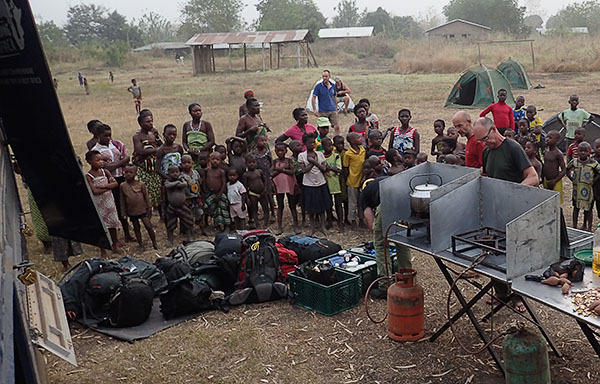 The grounds of this primary school made for a great bush camp – the children were fascinated as we set up camp for the night! We had plenty of interesting stops along the way. In the photo above, Alice is standing in front of the Aledjo Fault, a stunning geographical feature through which the main road passes. 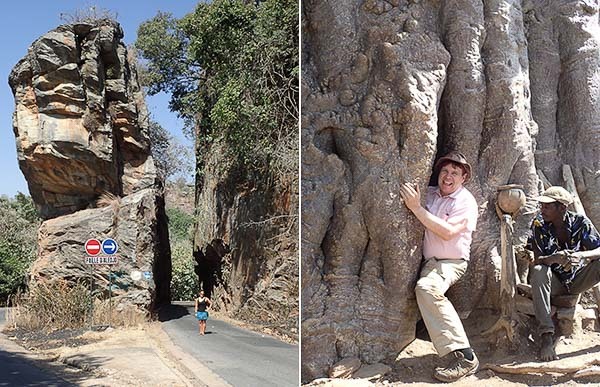 On the right, Frank is trying to get through the entrance of a sacred Baobab tree, which has a large cavity inside with room for about half a dozen people to stand in. It was a bit of a tight squeeze! Below are the weavers hard at work at a local co-operative we visited. They were weaving long but narrow strips which were then sewn together to make a range of colourful garments. The Tamberma Valley World Heritage site is home to the Batammariba people. 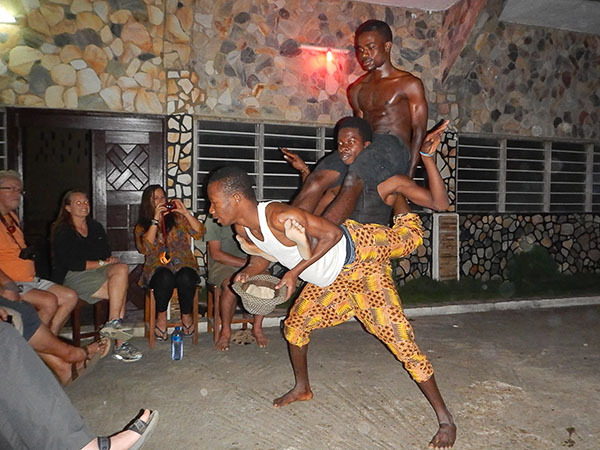 We spent 2 nights with them in Togo, visiting their fascinating ‘Takienta’ (mud fortress houses), learning about their customs and beliefs, and witnessing traditional music and dance ceremonies. Below, Tracey tries her hand at archery. It’s a good job we weren’t relying on her to catch our dinner! As the day cooled off we trekked up to a cave network, formerly inhabited as a retreat in times of tribal war. From here we were treated to some spectacular views of the valley below. From here a short drive took us over the border to Benin and the Atakora hills, home of the Tammari people. 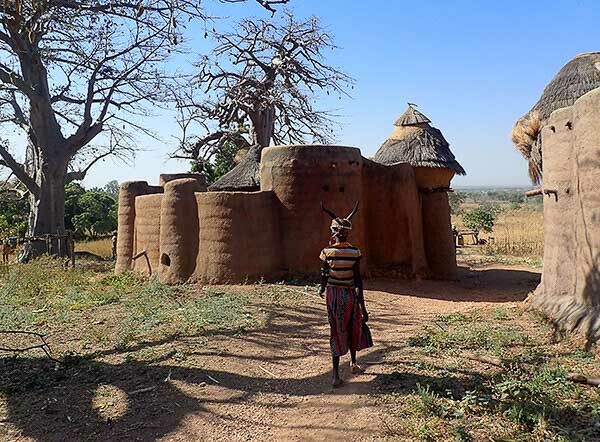 We learnt about their animist traditions, and saw the similarities between their fortress houses with those of their cousins in Togo. Most of these were spread out among their agricultural land rather than being grouped into villages. We trekked to see waterfalls, caves and farming land. Above are examples of giant grain storage jars which are partitioned inside. They’re in a cave, near a water source that was used as a retreat in times of tribal conflict as well as to escape the slave raiders. It is believed that people could have hidden for up to 6 months inside! Below, Frank, Tony, Al, Alice, Theo and Tony stand outside a sacred Baobab tree which we visited on another trek. Millett is a common crop of the area and is made into millet beer. Above, Tony and Sam share a gourd of it, wondering if it might be a little more palatable cold! We watched 2 locals down a gourd, drinking simultaneously from the same vessel, but didn’t manage to pull off this same feat ourselves! Below, Jason climbs up to look inside a grain storage hut on the roof of a house, which is partitioned inside for different crops. A bell on it’s rain hat stopped thieves getting inside without waking the household who would sleep nearby for security. Another short drive took us to Pendjari National Park, part of the WAP complex, the largest protected wildlife zone in West Africa. We boarded a couple of 4×4’s for a bumpy and dusty day of wildlife viewing. We were lucky enough to see buffalo, water-buck, warthog, jackals, crocodiles, antelope, many different types of bird, and numerous herds of elephants. At our first coffee stop we were treated to a rather special encounter with a group of elephants that wandered right past us. We also visited a pool where we saw many hippos up close. Below, Tracey, Janet and Sam were getting as dusty as possible on the game drives! From Pendjari we headed across the border to Burkina Faso and after a great bush camp we stopped in Fada where, above, Al is in front of the signs. Here we encountered a major problem…no eggs! Jase and Al were both very concerned about the next few breakfasts! 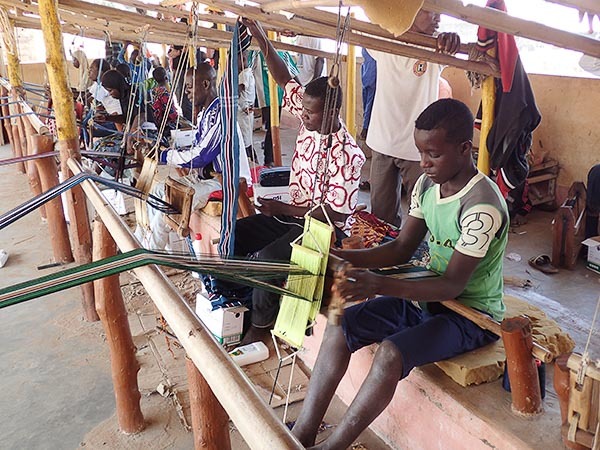 We then travelled west to Bobo Dioulasso, home to skilled artisans and a fantastic live music scene. Some of the group visited the impressive domes de Fabedougou (above) and the nearby Karfiguela waterfalls. The trip ended all to soon in Ouagadougou, but we’ll be back in Burkina Faso very soon to explore further on our current Accra to Freetown trip. Many thanks to some of the passengers for allowing us to use their photos we very much appreciate it!